The Trust remains deeply committed to raising standards and achievement for all children regardless of ethnicity, race, gender or religion. If children are to achieve academically, socially and emotionally to the best of their ability, it is essential that their basic needs for safety, protection and inclusion are successfully and confidently addressed. All children have a fundamental right to be protected from harm, attend school and have their specific individual needs met. 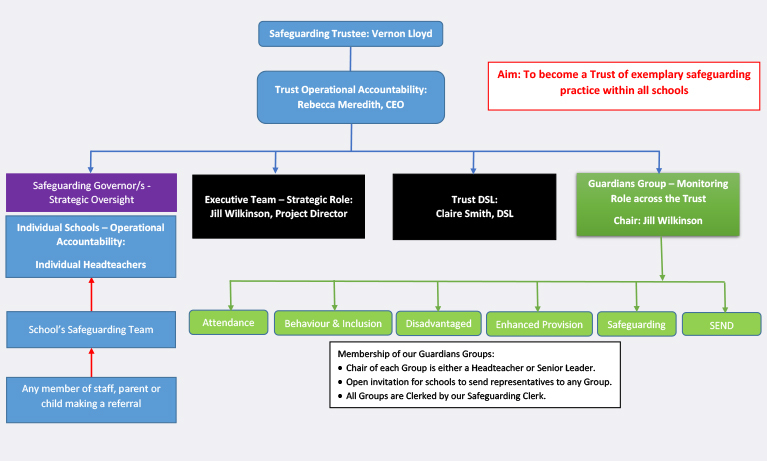 Transform’s Safeguarding Team meets with the named Safeguarding Trustee prior to every Board meeting and the Executive Safeguarding Team meets each half-term. Safeguarding and the protection of our children, young people and staff is a key priority for the Trust and that’s why we have established our ‘Guardian’s Group, and a number of sub-groups specifically monitoring all safeguarding areas. The core function of our Guardians Group and its sub-groups are to provide support and guidance; to share and learn practice; and to challenge schools to ensure that children and staff are kept safe, attend, have equal access and their welfare promoted. Our Guardians also have responsibility for ensuring that our schools are compliant with safeguarding legislation. This includes having rigorous recruitment processes for staff and volunteers, induction and mandatory and ongoing training. Our Guardians and its groups, meet at least five times a year. Each school has a named Safeguarding Governor. We expect our Safeguarding Governors to have an overview of all things Safeguarding in their own school. We also expect that they are appropriately trained, have a good level of safeguarding knowledge and conduct regular visits in schools focusing on safeguarding. All our Governors are expected to have attended basic safeguarding training. This can be done through their school, through the Trust’s online training, by attending a Trust face-to-face training event, or through their own workplace. We do expect our Safeguarding Governors to have also completed Safer Recruitment. We have a range of Trust safeguarding policies and guidance for all of our schools that ensures clear and robust action can be taken when required. Our safeguarding practice allows our schools to provide a safe place for children, young people and adults to engage with us. We aim to demonstrate that our safeguarding practices are like a golden thread running through our schools, their curriculum and everyday life. Each school has its own Safeguarding Policy which is in line with the latest Keeping Children Safe in Education and Working Together to Safeguard Children. Safeguarding is paramount and we expect all our employees to undergo a DBS check. As a Trust we have also bought into a Safeguarding Training package which offers online training to all our schools and Trust Centre staff. We ask all our staff to act responsibly and ensure that they are using the highest level of protections on social media networking sites. We do not expect staff to have Facebook or any other social media accounts with anyone under the age of 16 and advise all staff to give careful consideration before having accounts with young people under the age of 18. We expect staff to use their professionalism and discretion at all times. Interested in joining Transform Trust? A company limited by guarantee registered in England and Wales. Company no: 08320065. Registered Office Address: Unit 11, Castlebridge Office Village, Kirtley Drive, Nottingham, NG7 1LD.